When it comes to food, fall means lots of color and flavor. This soup combines roasted butternut squash with fresh ginger and turmeric for a delicious anti-inflammatory boost. The natural sweetness of the squash is the perfect balance to the spiciness of the ginger, and this soup is a great way to stay healthy this season. Double the batch to use this as an entrée or to make sure you have enough for leftovers. Preheat oven to 400 degrees F. Cut squash into 1-inch cubes and toss with 1 tablespoon of coconut oil. Lay flat on a sheet pan and roast for 25–30 minutes, tossing at least once, until squash is tender and lightly browned. Add remaining tablespoon of coconut oil to a pot over medium heat. Add the onion, ginger and garlic and sauté for 5 minutes, until fragrant. Add the roasted squash, turmeric, vegetable broth and salt and bring to a boil. 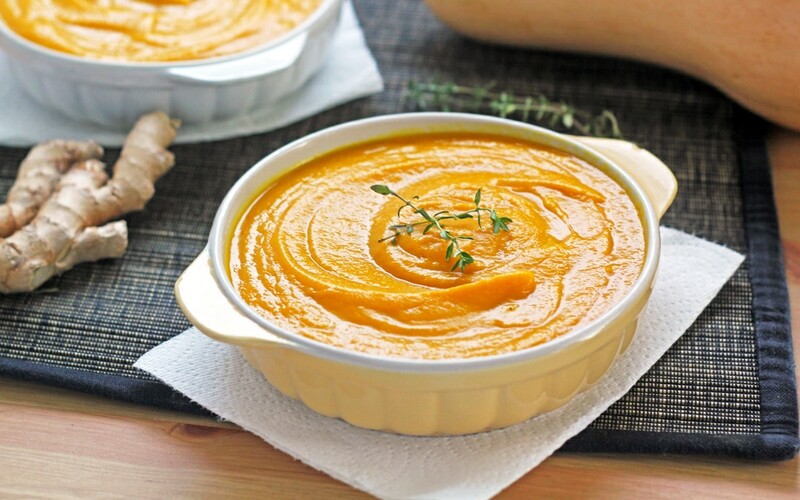 Use an immersion blender to blend the soup until smooth, or carefully transfer the ingredients to a blender, holding the lid down while blending to ensure the top does not fly off. Serve hot, with a sprig of fresh thyme (if using).